Clean energy utility company Enerwhere, a DEWA certified company based in Dubai, have raised more investor funds than any other to date on the Eureeca equity crowdfunding platform. They have now reached 94% of their USD$700,000 target. In the past investor interest in energy in the Middle East was predominantly focused on oil & gas, but this raise is a sign of changing times. Investors are now looking for energy businesses focused on renewable energy. Part of the challenge they have faced is finding companies and projects to invest in. Only 3% of renewable energy investment globally is concentrated in the Middle East*. 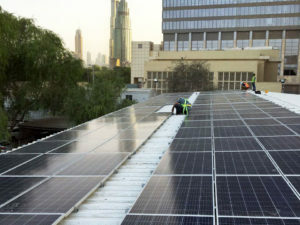 However, this is set to grow exponentially in the coming years with GCC countries such as the UAE, Oman and Saudi Arabia announcing renewable energy tenders, starting net-metering programmes and reducing fossil fuel subsidies. Enerwhere, which provides cost efficient and cleaner energy solutions across multiple industry sectors, is one of the few GCC based energy enterprises that is interesting not only to large institutional investors but individual investors and family funds that are sustainability minded. Their hugely successful crowdfunding campaign actively demonstrates the increased interest in renewable energy from local investors with over 80% of the funding coming from GCC based individuals and entities. “We have seen a lot of interest from investors around the region who want to do good and do well. Our double-digit growth in cleaner energy solutions is evidence that this is possible and we are commissioning new projects every week. Now really is the time for investors to get a share of the business before the investment opportunity closes,” announced Daniel Zywietz, CEO of Enerwhere. Those interested in investing in Enerwhere before they hit their target can find more information at: eureeca.com/enerwhere. Enerwhere is the world’s first distributed solar utility company, based in Dubai. Enerwhere uniquely combines a range of technologies to provide the cheapest, cleanest, and most efficient energy solution to meet the power needs of customers in construction, oil & gas, mining, hospitality and manufacturing sectors. Because all of Enerwhere’s equipment is fully modular and transportable, these solutions are available on a rental / lease basis, saving customers money from day 1. In order to fund its triple-digit annual growth, Enerwhere is currently raising funds via the eureeca.com equity crowdfunding platform. Enerwhere will use the funds to procure additional solar and battery equipment, and to fund working capital. For more information and to register interest in the crowd funding please visit: http://info.eureeca.com/enerwhere. For further information about Enerwhere, please visit www.enerwhere.com.